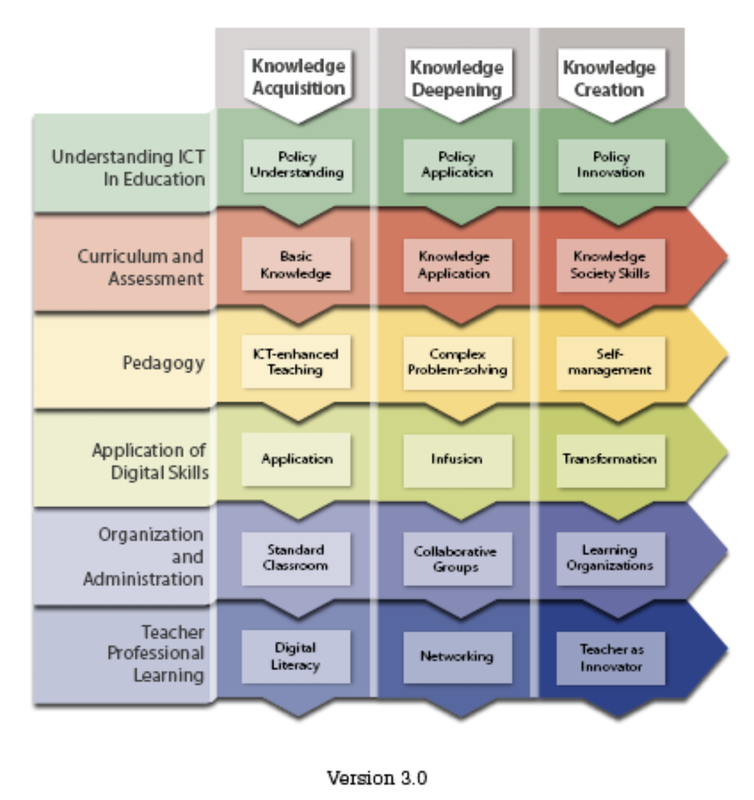 The ICT Competency Framework for Teachers (ICT CFT) Version 3 is a tool to guide pre- and in- service teacher training on the use of ICTs across the education system. It is intended to be adapted and contextualized to support national and institutional goals. Its target audience is teacher-training personnel, educational experts, policy-makers, teacher support personnel and other professional development providers. Implementing the ICT CFT requires an enabling strong environment, including a determined leadership from government, from those responsible for teacher education and professional development of in-service teachers, and from head teachers and school principals. The ICT CFT Version 3 responds to the 2030 Agenda for Sustainable Development, adopted by the UN General Assembly, which underscores a prevalent global shift towards the building of inclusive Knowledge Societies. It addresses recent technological and pedagogical developments in the field of ICT and Education and incorporates inclusive principles of non- discrimination, open and equitable information accessibility and gender equality in the delivery of education supported by technology. The UNESCO ICT CFT framework identifies 18 ICT competencies to which teachers should aspire and subdivides these into 64 specific objectives. The competencies range from encouraging teachers to understanding national priorities as identified in national ICT in Education policies, how ICT can support the curriculum, assessment strategies, pedagogy, school and class organization, administration as well ongoing professional development. The work of ICT intersects with the work of the Open Educational Resources programme of UNESCO as it trains teacher-training personnel, educational experts, teacher support personnel and other professional development providers to use ICTs in developing their courses to become accessible to all.